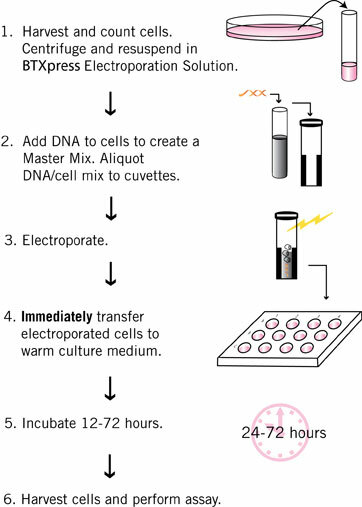 BTXpress Electroporation Solution is a single buffer solution developed to quickly and efficiently deliver genes into mammalian cells that were previously considered "hard to transfect" by chemical and other non-viral methods. This solution, in combination with BTX electroporators, provides researchers with the versatility needed for success across a broad range of cell types while maintaining critical cell viability. Transfection using this high performance electroporation solution is equally effective in delivering DNA as well as siRNA into mammalian cells. 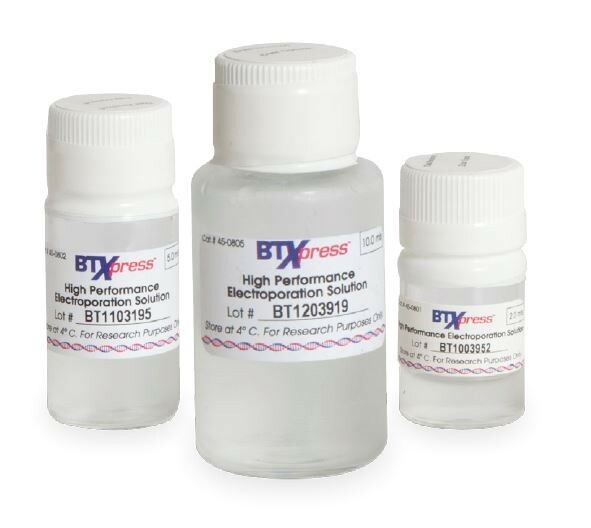 BTXpress Electroporation Solution is the first electroporation reagent that meets all of your high performance transfection needs without sacrificing control over your experiment or your budget. It offers increased numbers of transfections per kit compared to other commercial alternatives, providing higher value to you. As a universal solution, the BTXpress Electroporation Solution can be used in other electroporators, including the Amaxa™, to deliver similar results without the typical high cost associated with these buffer kits. The BTXpress Electroporation Solution is offered as a kit including the BTX Cuvettes Plus with transfer pipettes or as a buffer alone. 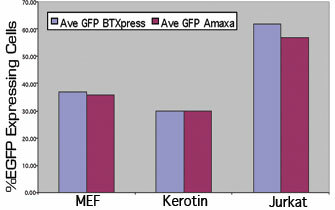 Table 1: BTXpress® “High Performance Electroporation Solution" vs. Amaxa™ Nucleofector®. Cells were electroporated with an EGFP reporter vector in parallel, using the BTX ECM 830 Square Wave Electroporator with the BTXpress™ High Performance Electroporation Solution or using the Amaxa™ (Lonza) system. EGFP expressing cells were identified 24hrs post-electroporation by flow cytometry and presented as a percentage of the live cell population. 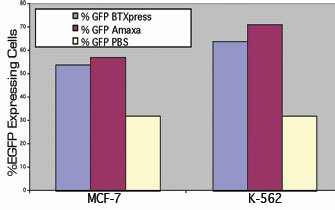 Table 2: BTXpress® Solution Transfection Efficiency vs. Amaxa™: Cells were electroporated in parallel with an EGFP reporter vector using either the BTX electroporation system with BTXpress™ High Performance Electroporation Solution or PBS. In comparison to the same cells transfected in the Amaxa™ (Lonza) system using the Amaxa™ kit V solution. The EGFP expressing cells were identified 24hrs post-electroporation by flow cytometry and presented as a percentage of the live cell population.